I have such fond memories of these books, I am afraid to reread them. I want to remember them how I remember them and not how I have possibly outgrown them. I may try. 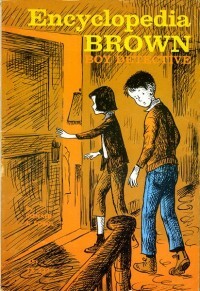 Encyclopedia Brown is a series of books featuring the adventures of boy detective Leroy “Encyclopedia” Brown. The first of the long series of children’s novels written by Donald J. Sobol was published in 1963. The series has also spawned a comic strip and a TV series. Each book in the Encyclopedia Brown mystery series is self-contained in that the reader is not required to have read earlier books in order to understand the stories. The major characters, settings, etc. are usually introduced (or reintroduced) in each book. Books featuring Brown are subdivided into a number—usually ten or more—of (possibly interlinked) short stories, each of which presents a mystery. The mysteries are intended to be solved by the reader, thanks to the placement of a logical or factual inconsistency somewhere within the text. This is very similar to the layout of Donald Sobol‘s other book series: “Two-Minute Mysteries“. Brown invariably solves the case by exposing this inconsistency, in the “Answers” section in the back of the book. Often these books follow a formula where the first chapter involves Brown solving a case at the dinner table for his father, the local police chief in the fictional town of Idaville. Encyclopedia solves these cases by briefly closing his eyes while he thinks deeply, then asking a single question which directly leads to him finding the solution. The second mystery often begins in the Brown garage on Rover Avenue, where Encyclopedia has set up his own detective agency to help neighborhood children solve cases for “25 cents per day, plus expenses.” This second case usually involves the town bully and mischief maker, Brian Ash, also known as Bugs Meany, leader of a gang who call themselves the Tigers, who, after being foiled, will attempt revenge in the third mystery. In the third mystery the plot involves Encyclopedia’s partner, close friend and bodyguard, Sally Kimball, the one person under twelve years of age to physically stand up to Bugs. She is the only reason neither Bugs nor any of his Tigers ever try to physically attack Encyclopedia. Encyclopedia tends to dislike anyone that she has a crush on, possibly indicating that he has a crush on her. Also intelligent, she once attempted to prove herself smarter than Encyclopedia by stumping him with a mystery of her own creation. However, she was beaten in the contest (although Encyclopedia admitted that she almost tricked him), after which she became his friend. In that story Bugs or his gang usually sets up some sort of trap to get Encyclopedia or Sally in trouble. However, like in the previous story they make a key mistake which Encyclopedia exposes. Later cases may find Encyclopedia assisting his father at a crime scene (rarely more serious than larceny, and Encyclopedia is always discreet when helping his father) or interacting with people around town, often exposing scams. One such example is a high school dropout and would-be con artist named Wilford Wiggins who spends time trying to dream up schemes to fleece kids out of their money. Like Bugs, his schemes have an inconsistency which Encyclopedia exposes. In some cases it is Sally and not Encyclopedia who figures it out because in her words, “You are a boy.” In other words, she notices things that only a female would find inconsistent. Sally further displays her intelligence in the various mysteries in that she often can deduce who committed the crime, or whether a certain person is lying, but she simply cannot always prove it.